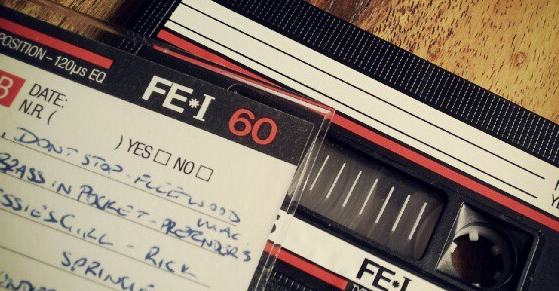 Despite the plethora of plus-points stemming from the dawn of the digital music era, it’s difficult not to hanker for the halcyon days of yore, when mix-tapes ruled the roost. I’m sure mix-tapes can’t have been as good as I remember them, but I know many people with a similar soft-spot for those little plastic, reel-filled rectangles. They were great ways of discovering new music, and sharing tastes with friends. They were also good presents to give a girlfriend, when teenage funds were a little more restrictive. But alas, we must embrace change. Given the choice between carrying a sackful of mix-tapes on holiday, or constructing a few impromptu playlists on my mobile phone, well, it’s a no-brainer really. With that in mind, there has actually been a number of services over the years that have tried to merge the magic of mix-tapes with the delights of the digital age. There was the wonderful Muxtape, which went down under a hail of RIAA bullets back in 2008. And then there’s the likes of Mixtape.me which arrived on the scene not long after Muxtape went belly-up. There are a number of other examples out there too, before we even get ’round to discussing the playlist features within Spotify and other licensed music-streaming services. But we’ve come across another neat Web app called Mixtaping.fm, that does a good job reimagining the mix-tape for the digital generation. For this, I created my own one by hitting the ‘Create Mixtape’ button at the top. You’ll have to give your mix-tape a name – what’s more apt than ‘Some Good Songs‘? Mixtaping.fm offers a really nice interface for users, and by and large it was easy and hassle-free to use, but it wasn’t without its flaws. For example, if you decide to abandon your mix-tape halfway through creating it, with a view towards coming back to it later, it’s not easy to find again. Just by chance, I clicked on ‘Create a Mixtape’ to start again from scratch, at which point it informed me that I had an incomplete tape, whilst offering me the chance to pick up where I left off. Also, users are forced to include cover art in their mix-tape creation – you actually can’t progress to compiling a tape until you’ve selected an image, an unnecessary prerequisite in my view. There are a couple of similar navigational quirks – but they’re not deal-breakers. Through tapping existing (legal) online music channels, Mixtaping.fm has the potential to build a great service here. Sure, it is just as easy (maybe even easier) to build and share playlists within the aforementioned services (Spotify and Rdio), but by throwing an audio cassette layer into the mix (pardon the pun), it’s a really fun way to create compendiums of compositions. Based out of an office in the Greater Los Angeles area, the founding team consists of Edward Chan (CEO), who has previously worked at MySpace, and Sang Noh (Head of Product), who has previously worked at Friendster. “Our intention is to be source agnostic, meaning if you have a premium Spotify or Rdio account you should be able to listen to the full tracks using services you already pay for,” says Noh. “We ultimately want to leave it up to the listener to pick and choose the service that works best for them,” adds Noh. Mixtaping.fm has recently just left beta, and services such as SoundCloud, Hype Machine and YouTube will be added eventually, which is good news for users internationally, where the likes of Spotify and Rdio may not be available. With so many other ways to listen to music online, including other mix-tape centric services, how does Noh see Mixtaping.fm fitting into the bigger picture? I personally think Mixtaping.fm is a great little service. It’s easy to share tunes, and the inherent limitations of a 60-minute audio cassette mean you actually have to put some thought into what tunes you select – there’s no room for ‘average’ songs.